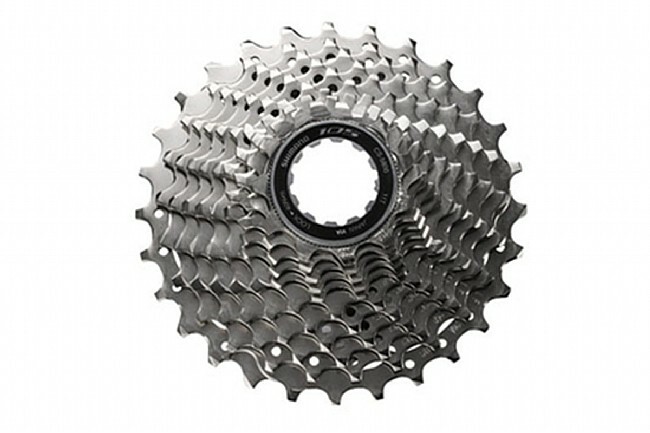 Shimano 105 CS-5800 11-Speed Cassette is one cog (or 11) in the machine that is working to bring high performance 11-speed to the masses. The new 11-speed group sets called for a re-engineering of each component in the group. Just like with the Dura-Ace and Ultegra level cassettes, the 105 had to get a fresh update. Though it is the latest in 11 speed you will still get the same quality performance and great price that you have come to know from the 105 line up. Shimano has made sure to optimize shifting across the entire range of gears, which has the added benefit of keeping your cadence smooth and consistent. Cheers to Shimano for making sure everybody can get a chance to try out 11 speed with the new 5800 line up. The 105 CS-5800 Cassette is available in 11-28T and 11-32T models. Great product for very reasonable price - installed with new groupset. Used as part of an upgrade to 10 years old bike - makes it operate like new. WBW's did a great job rebuilding the bike - on time and top quality work. This is a great value, for the cycle enthusiast! I viewed the specs of comparable cassettes and found this 105 CS 5800 11 speed cog to suit my needs. I am pretty happy with the 11-28 cassette. I run it on my new rain bike and really , its a great gear selection. I really wish the 11-25 was available in the 105 level but there is a 12-25 I may consider. Like any Shimano drivetrain component, its flawless. Shifting is smooth and precise. Seriously if your running 11 speed shimano there is an even cheaper cassette, not much diferent in function from my Ultegra 11 speed cassette. Can't go wrong with the 105 line for Shimano components. Shifts flawlessly. I think Wayne and Garth would say it is Shift-o-licious. Hey, what can I say? It's a Shimano cassette and it is flawless as always. Great value. Lightweight. Fits perfectly on an older set of Mavic wheels.